In the last two Tech talks I have been discussing the production of heavy oil from the deposits in the Orinoco Basin in Venezuela. Production of that oil requires, in part, the injection of large quantities of natural gas. In writing about the resources that the country has, it would be remiss not to concurrently note the recent discoveries of additional volumes of natural gas offshore Venezuela, and the volumes that are thus available, not only for the oil fields, but also for a rising domestic consumption. 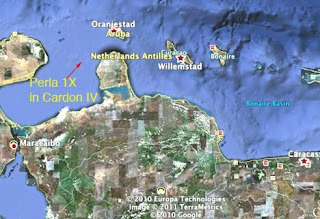 In November 2009, Repsol announced that the Perla 1X well had found the equivalent of between 1 and 1.4 boe of natural gas, said to be the fifth largest hydrocarbon discovery in 2009. (The other four, in debatable rank are Miran West (Iraq), Poseidon (Australia); Abare West in the Santos Basin (Brazil) and Tamar (Israel). You can argue about the size of some of the others – such as the Keathley Canyon discoveries in the GOM, since it depends on whose list (see slide 11) or other list you use. Location of the initial Repsol natural gas discoveries off Venezuela. The Cardon IV Block is currently licensed and operated by a Joint Operating Company named Cardon IV S.A. which is 50% owned by Eni and 50% by Repsol. The Venezuelan state company Petroleos de Venezuela S.A. (PDVSA) owns a 35% back-in right to be exercised in the development phase, and at that time Eni and Repsol will each hold a 32.5% interest in the project, which will then be jointly operated by the three companies. Given that the field is in relatively shallow water (70 m) it is anticipated that an initial production of some 300 mcf/day can be brought ashore and pipelined, by 2013. 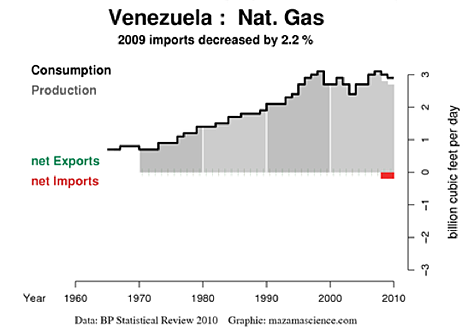 Now this may sound quite a bit, but Venezuelan production has been declining, to the point that the country has started to import natural gas. 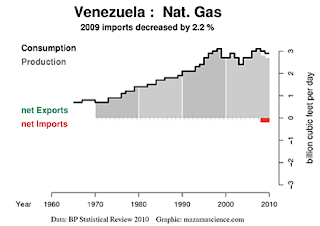 That import comes about because of the Antonio Ricaurte gas pipeline that was constructed between Venezuela and Colombia. 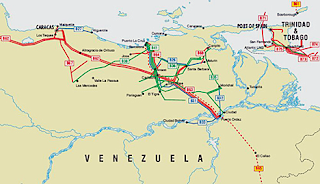 Begun in 2006, at a cost of $467 million to PdVSA, the 140-mile long pipeline was finished in 2007 with the initial idea that natural gas would first flow from Colombia to Venezuela, but then, within four to seven years, as the infrastructure in Venezuela improved, and the Guajira gas fields in Colombia decline, it would flow the other way. It has not had a totally smooth history, since just over a year ago Colombia reduced the flow, in part due to a rise in local demand. The fields that are supposed to provide the surplus natural gas and thus to allow the flow to Colombia after 2012 included those of the Mariscal Sucre project to the East. However when, most recently, bids were first issued for that project last January there were no bids. As Wiki-leaks found, this was somewhat upsetting to the Venezuelan government, who need the natural gas to pump into the oilfields and maintain the pressure needed for production. The problem appeared to relate to the price to be paid for the natural gas, relative to the $8 billion development cost. In the end PdVSA decided to go forward with the project themselves, using the Aban Pearl semi-submersible owned by an Indian-based company . But, back in May the semi-submersible sank, a week after igniting the gas flare at the beginning of the development. Initially, back in 2002, that project was to have been run by a partnership between PdVSA, Shell and Misubishi, as part of an LNG project. This was scaled back and PdVSA began to develop the project alone. At the time of the sinking the rig was drilling in the Dragon area of the project, slated to produce between 600 and 700 mcf/day, with an ultimate target for the project of 1.2 bcf/day. The field (ultimately possibly of 8 wells) would deliver to shore through a 70-mile undersea pipeline. Since the sinking of the rig, PdVSA has contracted with Technip to build a production platform for the field, with construction planned so that the original target of production by 2012 could still be met. Venezuela still has a large potential for producing natural gas, and from time to time has talked of developing LNG facilities to export some of this. The EIA cites three possible developments that were discussed in 2008, with the trains supplied from fields at Plataforma Deltana, Mariscal Sucre, and Blanquilla-Tortuga. Two years later Iran has just signed an agreement to help with the Delta Caribe project (which covers the first two trains) but while scheduled for 2014 it is interesting to note (along the lines of the swap arrangement that I mentioned in regard to Venezuelan oil last week) the first paragraph in the following release. The official added that Venezuela has long-term contracts with Argentina and Cuba to supply the countries with their required gas by 2013, noting that under the agreements inked between Tehran and Caracas part of their gas needs will be procured by Iran's LNG plant. Kheirandish stated that 40 percent of the project to construct Iran LNG plant is completed, expressing hope that the project will be half complete by the end of the current Iranian calendar year (March 20, 2011). According to the Letter of Intent signed between Iran and Venezuela, Tehran will help Caracas to build an LNG plant in Delta Caribe area, and Venezuela will also cooperate with the Islamic Republic to build an Iranian LNG plant in Venezuela with an annual production capacity of 5.4 million tons. Whether the LNG terminals get built is still likely a dubious question. The world market for LNG is becoming more readily supplied, though to a degree that depends on how the domestic production in the USA shakes out. (And the development of shale gas in countries such as Argentina). As a result though Venezuela continues to find large quantities of natural resources, it will be the investment that brings these products to market in a timely manner that will validate the continuing promise of increased production at some future date. I love this nation-by-nation approach you are taking and the depth of knowledge and curiosity you bring. And I assume you have discovered that on most computers you can just grab a databrowser image with the mouse and drag it into the document you are composing. Best wishes for a prolific year of blogging!